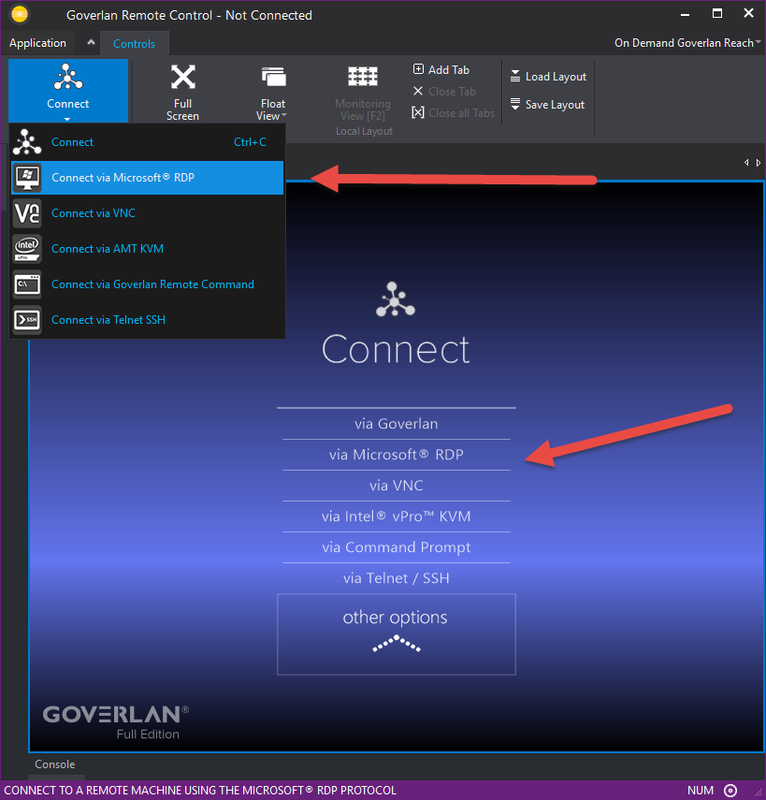 Other than the default Goverlan Remote Control Protocol which is established via the Goverlan Client Agent on the remote machine, Goverlan Reach RC has multiple connection protocols that are built-in, which do not require the Goverlan Client Agent installed on the remote machine. Use the Connect button in the Command Bar or in the More Options section. 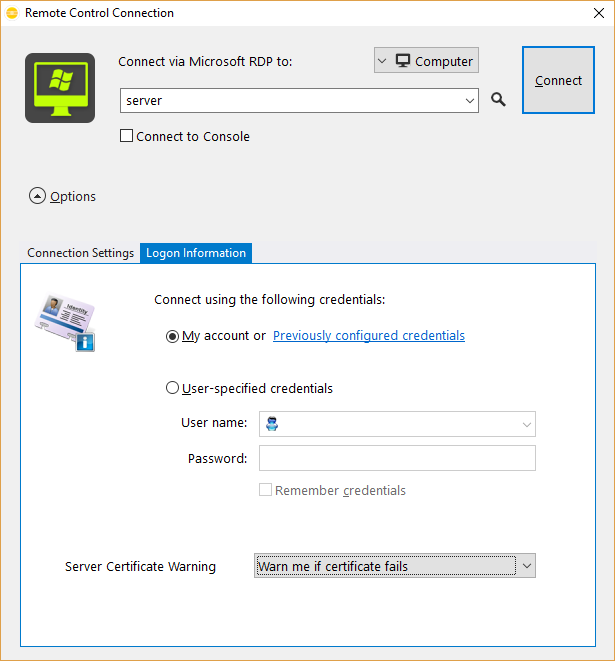 Use the Logon Information Tab to save RDP credentials. Credentials will be stored in the Credential Manager. 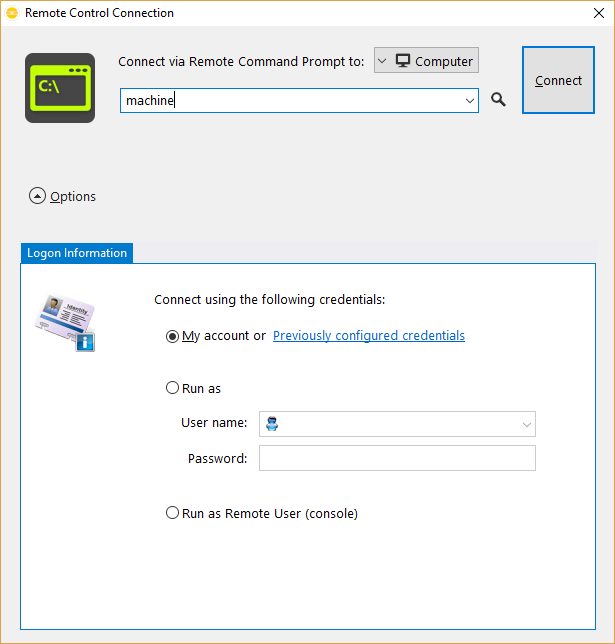 For more information on the Credential Manager, see Using Alternate Credentials in Goverlan. 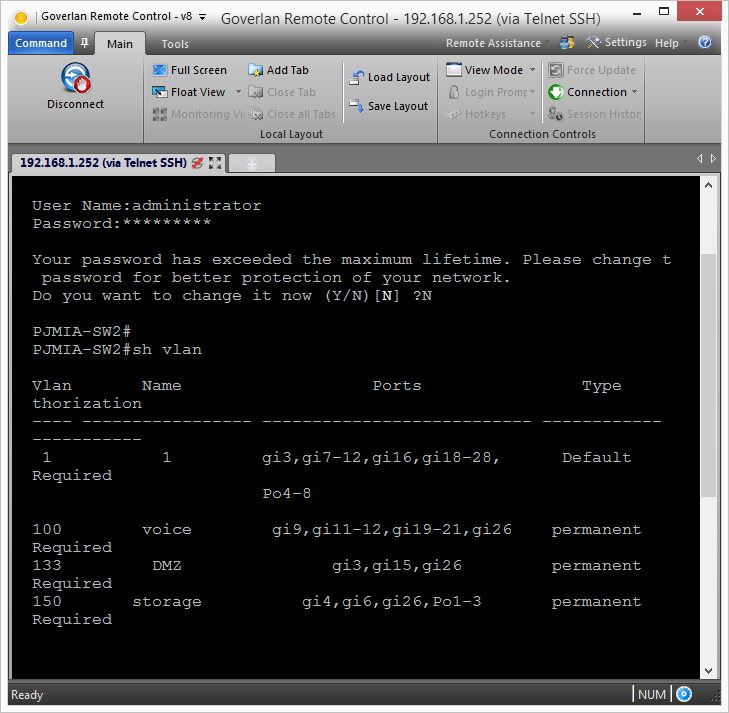 Goverlan supports Certificate RDP connection. Use the Security drop down and select the appropriate connection type. 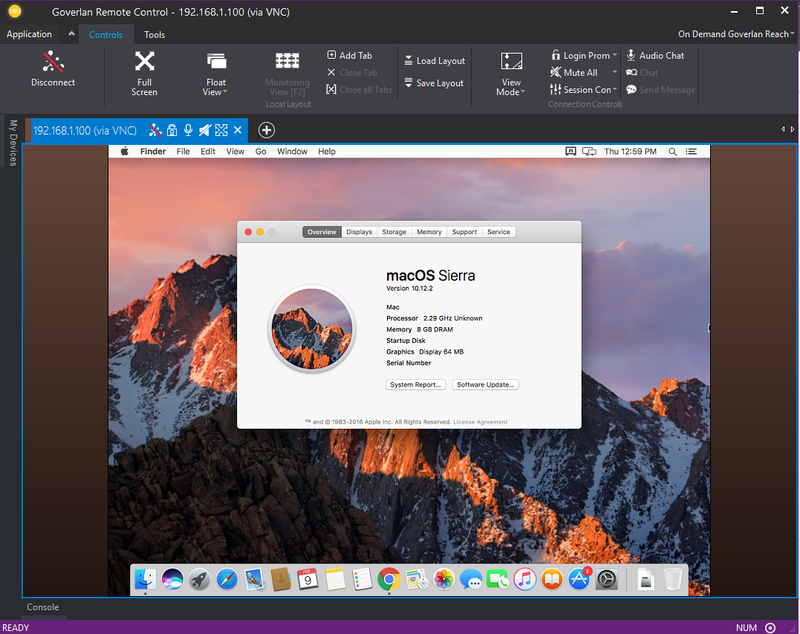 Initiate VNC Connections to Mac, Linux or any other devices running VNC server software. Mac/Linux Remote Desktop Access must be configured first. Please consult your operating system guides for enabling Remote Desktop Access. 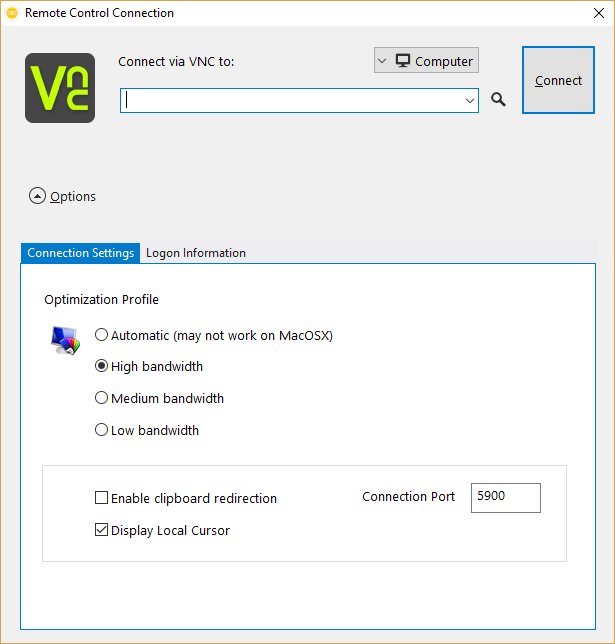 Starting a new VNC connection. 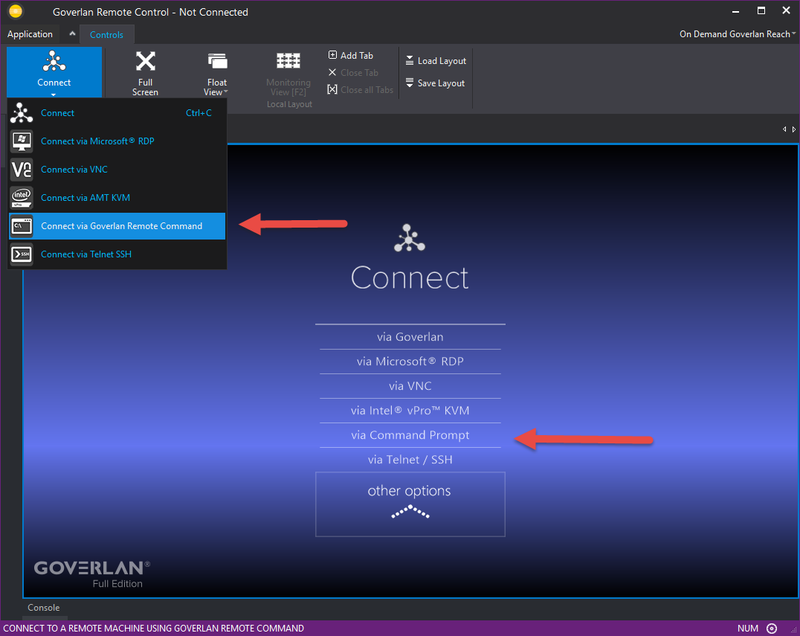 Step 1: Choose VNC from the Connection drop down on the Command Bar or from the Connections Button. 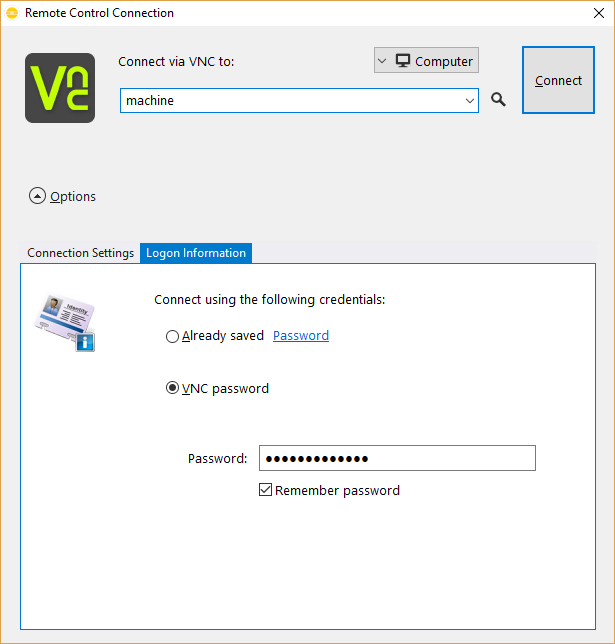 Use the Credential Manager to store VNC credentials for later user. For more information, see Using Alternate Credentials in Goverlan. Click the Connect button to establish a connection. 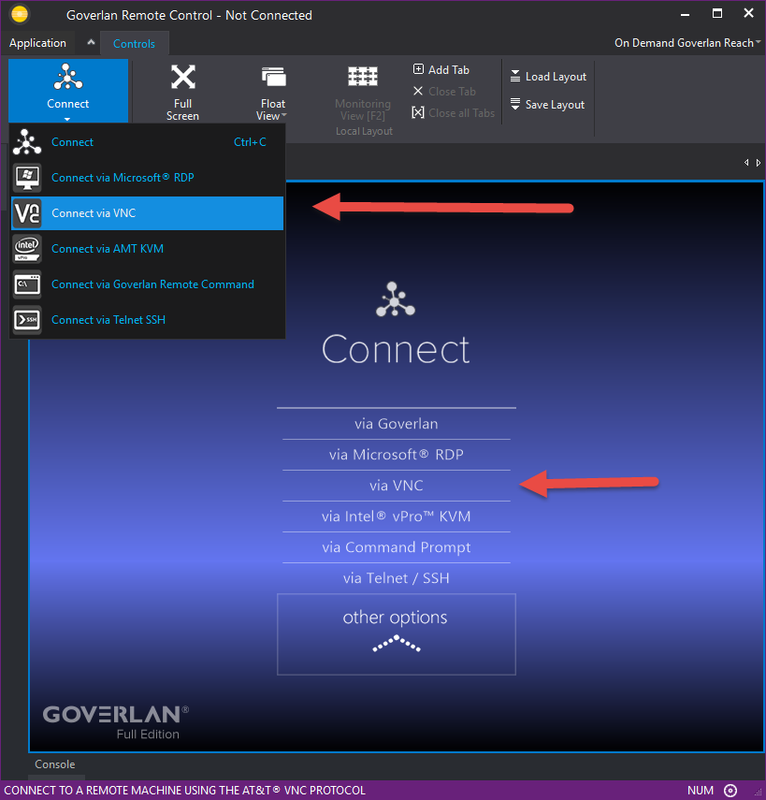 Goverlan Reach RC provides easy access to the Command Line or PowerShell Command Line of any Windows system on your network. Choose via Command Prompt from the More Options drop-down or the Connect button drop down in the Command bar. Enter the host name or IP address of the target system and specify the credentials to log in as. Goverlan will use the operator’s credentials by default. 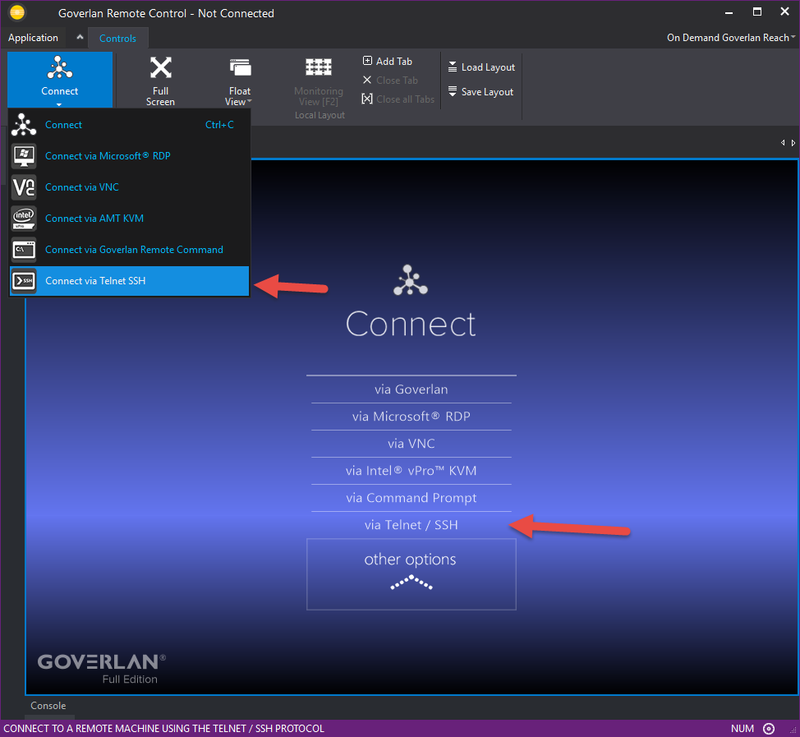 Use the Goverlan Remote Command Prompt connection to run any commands directly on the target system. 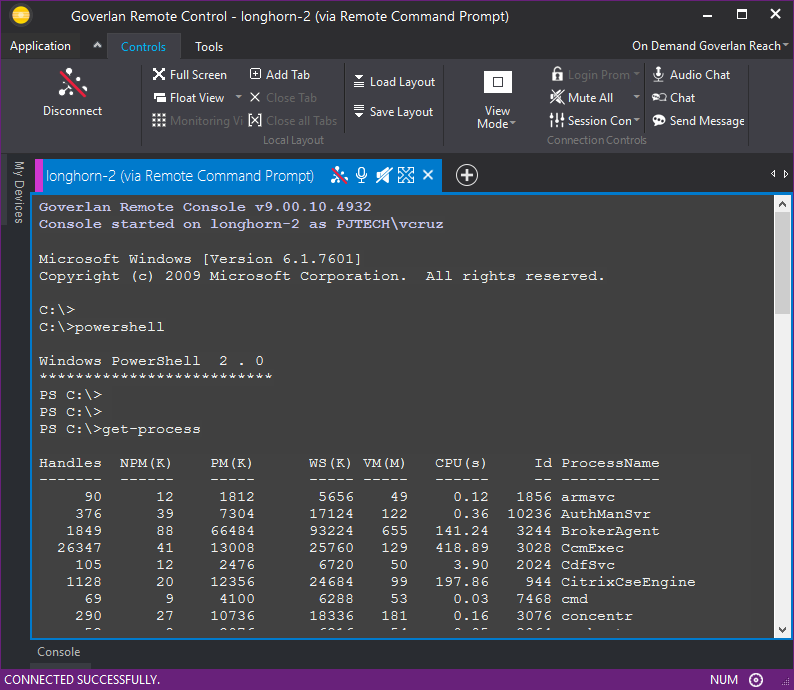 Invoke the PowerShell command prompt by typing the command PowerShell. 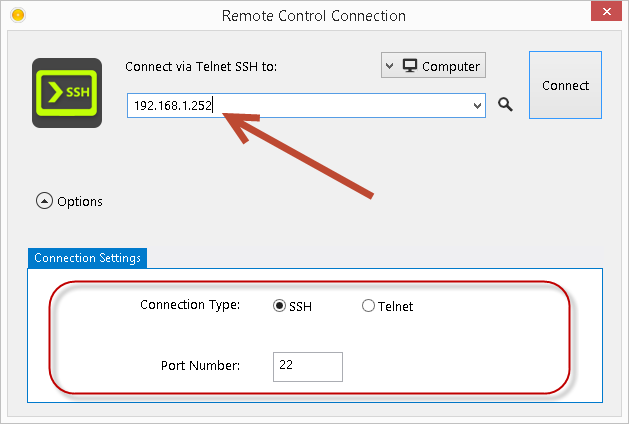 Use Goverlan Reach RC to connect to any Telnet or SSH device such as network devices or printers. Choose via Telnet SSH from the More Options drop down or the Connect drop down in the Command Bar. 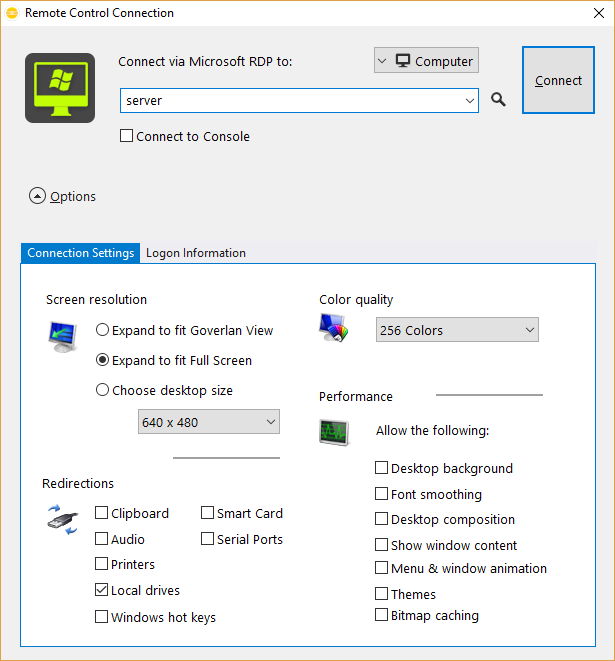 Choose the Connection type and the port number if it is not standard. Click the Connect button to establish the connections. 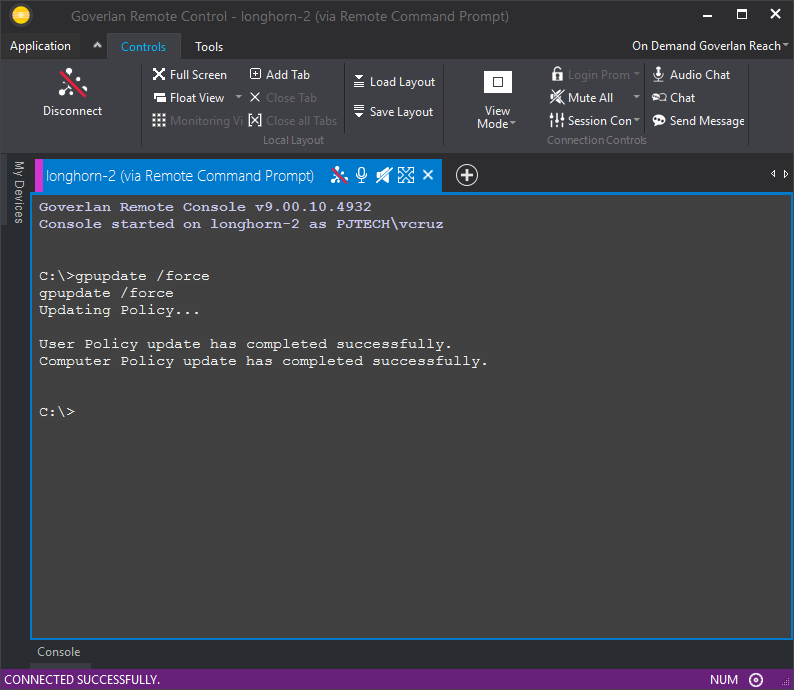 For more information on how to use the Intel vPro Protocol within Goverlan, please refer to, Goverlan Remote Control – Intel vPro.